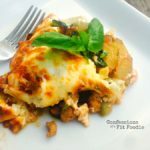 Looking for a 21 Day Fix Lasagna? This lazy, one skillet zucchini lasagna is easy, amazingly delicious, low carb, and 21 day fix approved! Spray an oven safe pan with olive oil spray and cook turkey sausage through. Add garlic to pan and saute for a minute, then add a zucchini and spinach. Spray with additional olive oil spray and cook until zucchini is crisp tender. Add in basil and stir. Remove from heat. Flatten veggies and meat down a bit with your spatula, and then cover mixture with tomato sauce. Mix one egg, and T of Parmesan cheese into ricotta and sprinkle with fresh ground pepper. Layer ricotta mixture on top sauce. Finally, top with mozzarella cheese. Place in your broiler on low for 5-10 minutes or until cheese gets nice and toasty brown. Keep an eye on it, as it happens fast! Remove from oven and let sit for a few minutes. Just before serving, make a small cut into the lasagna and very carefully drain out the excess water from the pan. While this step is optional, because zucchini releases so much water, I think it’s worth it! Just use those oven mitts and be careful!! Top with extra Parmesan cheese and sauce, if desired.